August 11, 2016 through August 17, 2016. This trip to Scotland is limited to 22 persons. You plan your own travel arrangements to place you in Edinburgh, Scotland on August 11, 2016. This will allow you the option to begin your vacation travel early and/or stay for an extended period of time if you so choose. 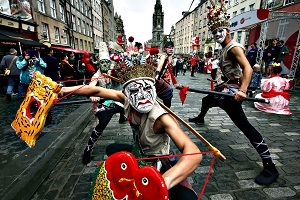 Once in Edinburgh you will be surrounded by the excitement and entertainment of what is the Edinburgh Festival Fringe the world’s largest arts festival which lasts nearly the entire month of August. 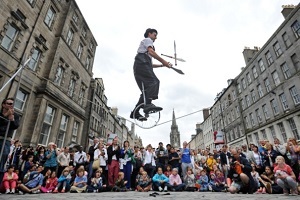 The festival includes hundreds of street performers and over 250 performance venues. There is LIVE entertainment to be enjoyed around every corner. While in Edinburgh you will enjoy the accommodations of a 4 Star Hotel, including a proper Scottish breakfast every morning. The hotel is in the Grassmarket district in Old Town Edinburgh just a few hundred feet from the base of Edinburgh Castle! You will be given a guided tour of Edinburgh from the internationally famous and kilted William (Billy) Chismon. 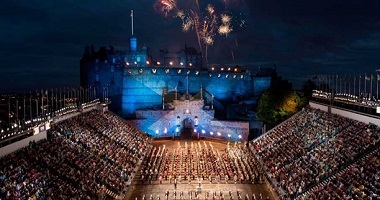 On the second night in Edinburgh you will have a ticket for The Royal Edinburgh Military Tattoo. The Tattoo showcases music, dance and display from around the world, and in 2016 will pay tribute to Her Majesty The Queen’s 90th birthday. Starting on the morning of the 3rd day (August 13) this Scottish adventure leaves Edinburgh on 2 Night / 3 Day Private Scenic Tour across the sweeping valleys, majestic mountains and mighty rivers of Scotland. During this 3 day tour you will visit such destinations as Stirling Castle, Dunvegan Castle (ancestral home of Clan MacLeod), Glenfinnan Viaduct (the bridge used in Harry Potter movies), Talisker Distillery, Eilean Donan Castle (ancestral home of Clan Mackenzie and used in the Highlander movie), and Loch Ness (home to Nessie). Enjoy all these sites and more including all the magnificent scenery along the way. 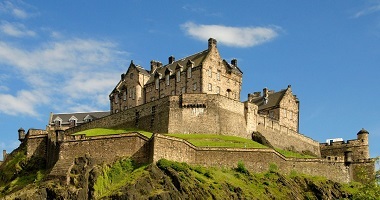 After the tour you will enjoy 2 additional nights of 4 Star Hotel accommodations back in Edinburgh. 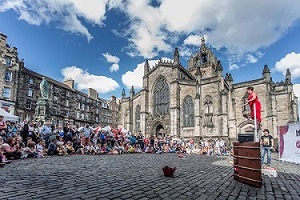 This allows you 2 additional days to experience the Festival Fringe and explore the City of Edinburgh on your own or, if you choose, venture out of Edinburgh to other destinations. You can hop a train to Glasgow, Scotland (less than one hour away) for the day, or maybe you want to venture a little further by train and visit Newcastle, England (less than 90 minutes away). The destinations and attractions are endless, get exactly what you want out of your vacation! 1) 4 Nights of 4 Star Hotel accommodations while in Edinburgh. This also includes a proper Scottish Breakfast each morning while in Edinburgh. Don’t forget this is during the world’s largest art’s festival too! 2) A ticket to the The Royal Edinburgh Military Tattoo. 3) A 3 Day / 2 Night Private Scenic Tour of Scotland. This includes hotel accommodations for 2 nights in Portree, Scotland located on the Isle of Skye while on the tour. 4) Dunvegan Castle & Gardens Admission. Dunvegan is the oldest continuously inhabited castle in Scotland and has been the ancestral home of the Chiefs of Clan MacLeod for 800 years. 5) Talisker Distillery Tour. 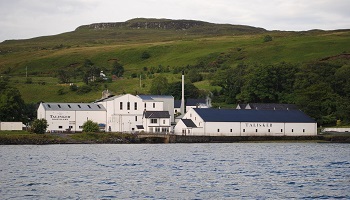 The oldest working distillery on the Isle of Skye, set on the shores of Loch Harport with dramatic views of the Cuillins. This alluring, sweet, full-bodied single malt is so easy to enjoy, and like Skye itself, so hard to leave. 6) Eilean Donan Castle Admission. 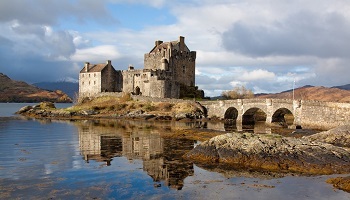 One of the most iconic images of Scotland, Eilean Donan is recognised all around the world. Situated on an island at the point where three great sea lochs meet, and surrounded by majestic scenery, it is now one of the most visited and important attractions in Scotland. 1) Your travel to and from Edinburgh. You plan your own travel arrangements to place you in Edinburgh, Scotland on August 11, 2016. This will allow you the option to begin your vacation travel early and/or stay for an extended period of time if you so choose. 2) Your meals. Other than your Scottish Breakfast, which is included with your hotel stay while in Edinburgh (4 days), no meals are covered. 3) Venue tickets. Other than the tickets and admissions mentioned in “What Is Included” above, no other venue tickets are included. You will need to purchase your own tickets if you choose to see additional venue performances, take any additional tours, etc. 4) Shopping & souvenirs. Other than one autographed photo per person of Billy Chismon in a kilt, no other gifts or souvenirs are included. If Paying By Check: $1750.00/person – Make checks payable to “The Celt Vacation Club”. Make sure the name(s) of the individuals going on the trip are written in the memo section. If Paying By Credit Card: $1800.00/person – If you are paying all or in part by credit card you will pay this slightly higher amount. The additional money is to cover the credit card processing fees. Both payment options above reflect “Double Occupancy” pricing – This price assumes double occupancy for 6 nights in hotel rooms. If you will be traveling by yourself and require your own hotel room the price will increase significantly due to the elevated hotel prices during the Festival Fringe. Contact Billy below if you are interested in going and will be travelling by yourself. 1) Deposit: A $750.00/person deposit is required to lock in your place on this adventure. This deposit is fully refundable up until Friday February 11, 2016 which is 180 days out from the vacation. 2) Full payment: All $1750.00 or $1800.00 per person is due by Friday May 13, 2016 which is 90 days out from this vacation. 1) Contact The Celt Vacation Club at vacationclub@theceltmckinney.com to verify there are still openings for this trip. 2) Pay your deposit by using the payment link above or by dropping off a check to Billy at The Celt, in order to lock in your position(s). 3) Make your full payment by using the payment link above or by dropping off a check to Billy at The Celt by May 13, 2016. 4) See you in Edinburgh, Scotland on August 11, 2016!